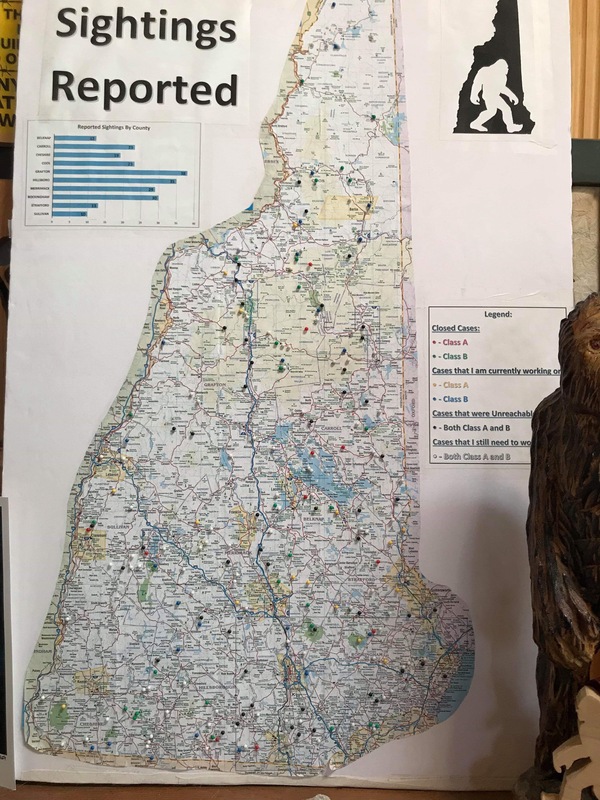 Possible 2019 New Hampshire Class B Sasquatch encounter? 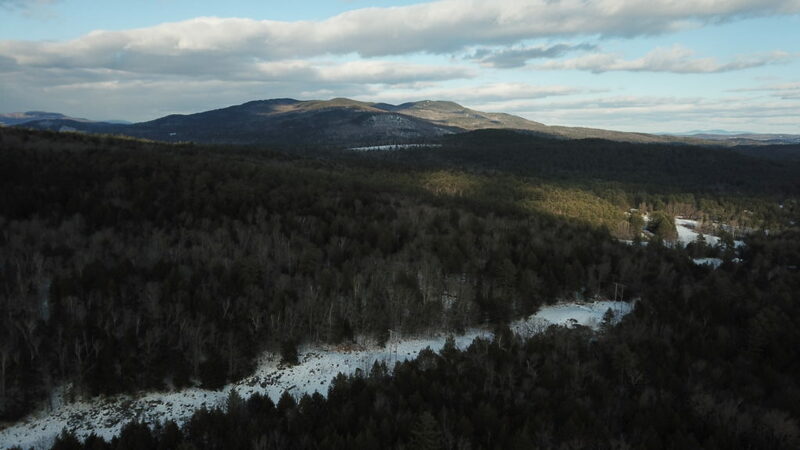 Recently I was contacted by an acquaintance who was having some strange "activity" near his rural property in the Sunapee region of New Hampshire. This happened less than a week before I gave a talk towards the end of February at the Derry New Hampshire public library on the topic of “Granite State Bigfoot”, all about sightings and history of Bigfoot like creatures in New Hampshire, was quite synchronistic in my view. On Saturday February, 16th, I was invited to the property in question to check it out. While I don’t really consider myself a “field investigator”, I went with a simple curiosity based on what was described to me and I attempted to adhere to the scientific method as much as possible. For his sake I will refer to this acquaintance by the name of “Joe”, due to his wish for anonymity. I’ll begin with a description of the location and the sequence of events that Joe described to me in length and great detail. Joe lives in a small neighborhood with a few houses surrounded by thousands of acres of woodlands, with rolling hills, rivers and larger mountains in the region. New Hampshire is the second most forested state in the United States after Maine, with an approximate 87% of New Hampshire being forested. On Wednesday January 30th, Joe was in his backyard that evening after dark gathering firewood for the woodstove in his home. The cut, stacked wood was being stored in a small open shed with a roof, pictured below. As Joe described the wood itself would usually have debris on it and thus to clean them off he would take two pieces of wood and smack them together two or three times and then place them on a small dolly used to wheel all the wood back to his home. Since the wood is quite dry it would produce a very loud clear knock type of sound, loud enough to make your ears ring. That particular night Joe went about his business doing nothing out of the ordinary gathering the wood. The wood shed in question, behind Joe's home. After three or so “knocks” with the dry wood, Joe described what sounded like a single very similar, loud and clear knock type sound coming from the forest across the street to the right of the shed. His first thought was “Some other sucker was out doing the same thing as I was, gathering wood late at night and he decided to respond”. Joe returned with another three knocks with the intention of having a “back and forth”, but there was no response. He didn’t think too much of it and finished up his business with the wood for the night. Two nights later (February 1st) between 5:00 and 5:30pm Joe was once again collecting firewood in the same location, doing the same wood cleaning method. This time he intentionally went out before it was dark and kept his ears peeled for any additional sounds. After knocking the dry wood together again multiple times he heard nothing. After bringing the dolly filled with wood up to his steps to enter his home, he then heard a single, knock coming from that same wooded area as a few nights prior. He described this one as sounding a bit further off than the other one. Joe immediately thought, “You’ve got to be kidding me. What is that?” In his mind, both of those knocks he heard were distinct and clear, intentional knocks. He described how much it differed from the regular tree creaks, woodpeckers or other natural sounds he had grown accustomed to hearing having lived on the property for over a decade. 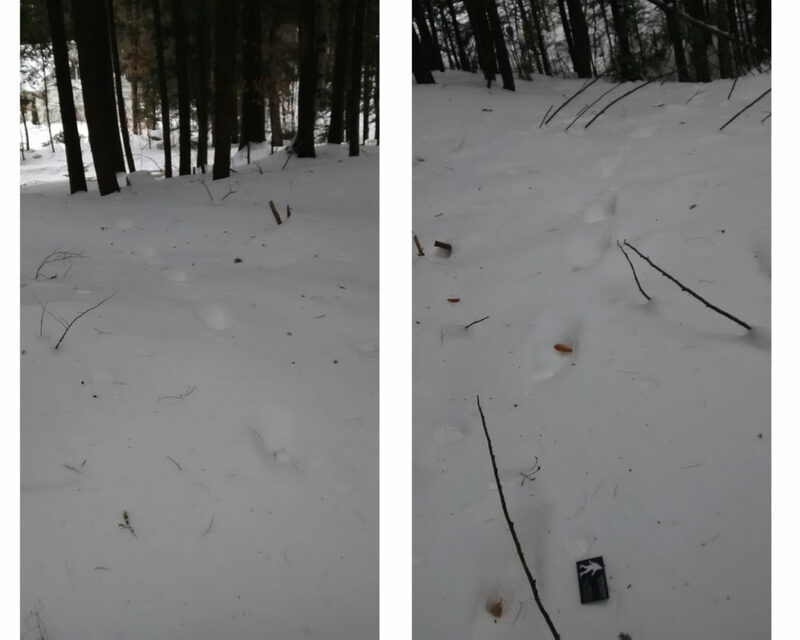 A few days after the two “knocks” Joe went into where the woods begin across the unpaved road right near his house and found a set of tracks in a straight line going up to a large tree that looked right at his property. The tracks were coming from down the small ravine that led for miles into the woods. 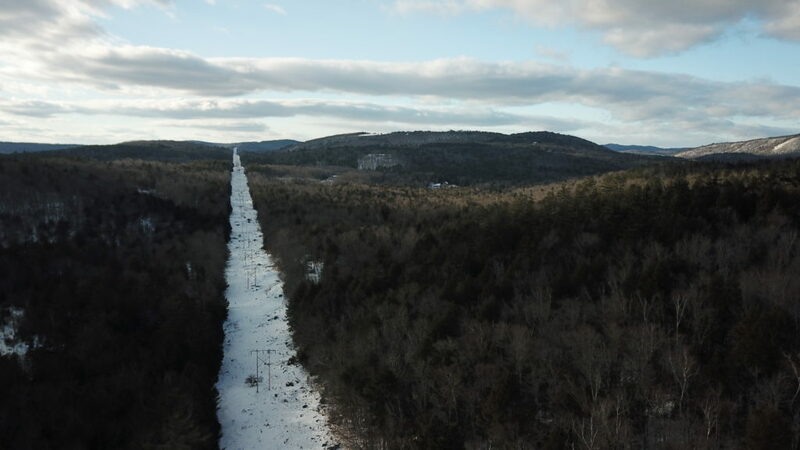 The tracks themselves were rather small and badly deteriorated from snow melting, so it is quite difficult to determine what they are, rendering them rather inconclusive. Joe used a Cliff Barackman business card for scale beside one of the tracks. Two of the track photos taken by Joe. Six days after the second knock (February 1st) on Thursday, February 7th Joe was out yet again gathering wood on a cold and wet night, with drizzling rain falling. He didn’t hear anything out of the ordinary while gathering the wood and went about his business. Before entering his home, he stopped for a moment to check a nearby birdfeeder to see if it needed any more feed. He then heard what he described as a “World war II air raid siren” type noise, which was strangely familiar. The noise was again coming from a north easterly direction but it seemed to project over his house towards him. He described it as loud but sounding like it was distant. He listened to the sound bewildered and described how it had incredible volume and changed slightly, like it was going up and down. All the while in his mind Joe was trying to rationalize the sound, thinking if it could possibly be a chainsaw, or a four wheeler nearby, but to him it was neither of those sounds, nor an air raid siren. Having heard some podcasts that discuss Bigfoot sounds and playing audio of alleged “vocalizations”, Joe determined this was where his familiarity of this sound came from. At one point Joe remembered to pull out his cell phone, which is an inexpensive Tracfone, and attempted to record what he was hearing. It was right around this time that his wife arrived home with their children, who came through the back of the house to see him in the yard and that is when the encounter ended. "The howl...rose, then plateaued (what seemed like forever:), and only at the end did I notice the undulations as it wound down and ended, prior to the last shorter howl about 15-20 seconds after the first one stopped." While Joe openly admits it’s possible that it could have been a person or something else, he was adamant that the “howl”, as well as the “knocks” were something he had never heard before in all his years living there. When I arrived on the property Joe and I planned to walk around the woods in the surrounding area. At that time the snow was nearly a foot deep and thus getting around was somewhat difficult, but excellent conditions for tracking. We proceeded to hike for about three hours, surveying the area, including where he found the strange tracks. A few inches of fresh snow had fallen since then, so there was nothing to be seen in that spot. We found ample footprint track evidence of rabbits, squirrels, deer, coyotes and possibly some gray fox. The area we hiked was quite beautiful, a real mixture of various tree species, with rolling hills and ravines, small ponds and creeks running through the area, as well as large boulders and glacial erractics being present. We came out to a large power line clearing that stretched as far as we could see, over nearby mountains and hills. It was in this clearing that I deployed my DJI Mavic drone to get some aerial shots. Those shots (seen below) helped establish just how rugged the area is on either side of the power line, with trees and mountains as far as the eye can see. On our return to Joe’s home, we took a different route and traveled through a swampy, marsh type area, that when not covered in snow and ice would be quite vibrant. Some drone shots of the area. While we didn’t see anything out of the ordinary while hiking, we did establish how viable of an environment the area was. It was teeming with evidence of wildlife even in the winter months. The prospect of the miles of power line clear cuts raised an interesting point in that various animal species will traverse along those clear cuts and use it as a way to get around easily. 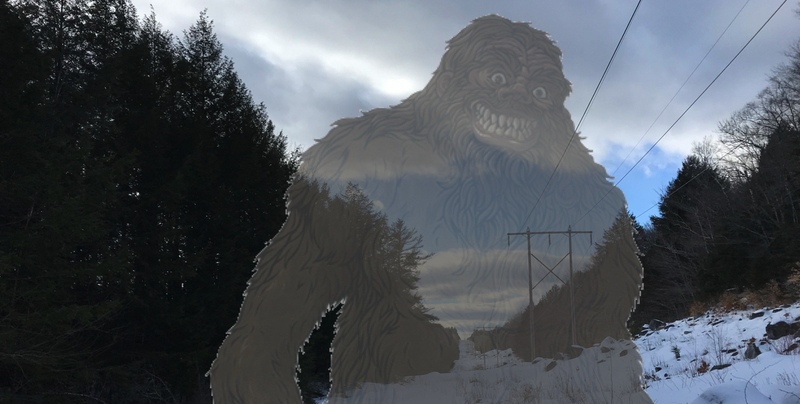 Some have speculated that the Sasquatch might do something similar, due to sightings along power lines. That of course is very much nothing but speculation at this point in time. Following the hike (and warming up by the wood stove), I proceeded to interview Joe on camera, letting him described the sequence of events. I then had him fill out a form describing, in detail, what he had experienced that week and a half. On a side note, subsequent data from a trusted friend who is a BFRO researcher revealed that there were quite a few both class A and class B Sasquatch sightings within the general region that this took place in, reported to the BFRO. All in all it was an interesting story to take note of and I had a great time surveying a beautiful part of the beautiful state of New Hampshire. A great map of New Hampshire class A & B sightings put together by Crystal Panek.